A warm, delicious scent of coriander filled the air. The carved door closed behind me and I looked beyond the cozy entry room of Junoon, where six other people (all of whom were couples) were checking their coats to the long open hallway beyond where the soaring ceilings were lit by candlelight. If this was going to be an aphrodisiac dinner, they’d chosen the right place. The bar at my left was packed with more people. I probably wasn’t the only person there solo — without a date or a friend — but it looked like almost everyone was part of a couple. I wasn’t alone for long — a server smilingly approached, offering me a choice of delicately designed hors d’ouevres on tiny black wooden plates. The bartender almost floated over to me, mixing three other drinks while at the same time asking what I’d like. I chose “A Dozen Roses” which was utterly charming. It was literally the color of perfectly red-pink roses, topped with a snowy foam and a single rose petal. I sipped it and walked around the crowded room, scoping out the scene, wondering if and when the aphrodisiacs would hit me. What would happen if they did? Would I start to giggle helplessly at everything? Or would I start trying to shoot sultry looks through my glasses at my intended love? The evening before Valentines Day can sometimes be as fraught with anxiety as the day itself, but this year I hadn’t felt worried at all about my single status. The invite to a tasting of an aphrodisiac dinner at Michelin-starred restaurant Junoon in the Flatiron District of Manhattan seemed like fun, and I was very curious about food and drink as aphrodisiacs. As the servers carried trays filled with nibbles of food through the crowd, at first I asked what the aphrodisiacs in each dish were, but then realized I sounded kind of ridiculous. After all, this was an aphrodisiac experience, why did I need to analyze each offering? That’s just not how love works. We take love as it is — and it can definitely confuse our critical capacities. How often have you heard the question “What does he or she see in him or her?” So I stopped asking questions and just sipped the cocktails, which were many — they were made of roses, spices, whiskeys, ginger liqueurs, not necessarily in that order. The gin and tonic filled a large, untraditionally rounded glass centered by a single diamond-like ice cube suspended under slices of lemon and lime. A pandam leaf hugged the side of the glass, its tip peeping out over the top. The bite-sized salmon, chicken, shrimp and cheese aphrodisiac foods melted on my tongue, the dense heat of the spices lingering afterward for several moments. I felt happy, but not as if I was going to amorously attack someone. But maybe that would still happen as I ate and drank more. In the middle of the evening, we were introduced to the chefs and management, and they discussed their philosophy of food and drink at their restaurant. Junoon means “passion” in Urdu, and passion is at the center of the architecture of menu, cocktails, wines and service at this place where fine dining service and haute cuisine techniques meet the too often underrated cuisines of India. My question of what exactly makes different foods aphrodisiac was never specifically answered over the course of the evening, but I definitely enjoyed doing the research. As I looked into the dining room space, I imagined the gleam of candlelight striking the silver and waiting wineglasses with someone sitting across from me at the table. The scent of toasted sweet coriander and cardamom fills the air around us, meeting the hot bite of mustard seed and the bitterness of cumin. I left alone. I did see a cute guy at the bar as I walked out, but I didn’t have my glass slippers on. Instead, I had studded black leather boots that were ready to hit the concrete sidewalk with no qualms. I had no prince, and I wasn’t Cinderella. And I had no worries about those facts. 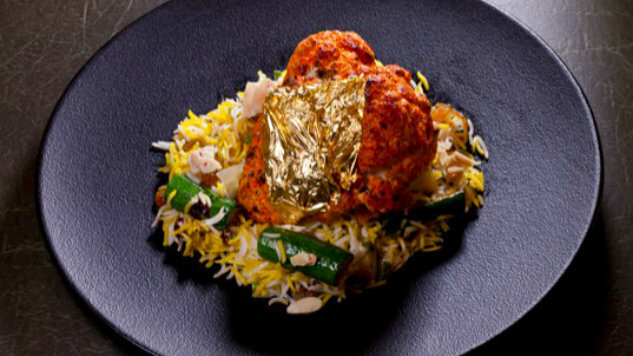 A sumptuous five-course aphrodisiac repast with wine pairings and romantic cocktails will be served on Valentines Day at Junoon in NYC.